My current food fetish is blood oranges — which is a rather hideous name for such wonderfully sweet and gorgeous colored citrus fruit. Recently, while figuring out our weekly menus, I noticed this tempting recipe for “Seared scallops with Blood Orange-Shallot Sauce” from the Feb/March version of Fine Cooking (recipe follows.) So on the next visit to the grocery store I picked up a couple. The recipe called for one blood orange, juiced, and when I cut into the fruit, I had forgotten how incredibly intense the inside was, with its crimson, almost blood-colored flesh… sometimes there is dark coloring on the exterior rind as well. And then when I tasted the succulent flavor, I knew I was hooked and I started pondering other ways in which to incorporate this little gem. Wikipedia fact: The three most common types of blood oranges are the Tarocco (native to Italy), the Sanguinello (native to Spain), and the Moro, the newest variety of the three. So within days, I found another recipe in our January issue of Bon Appetit for “Slow-Roasted Salmon with Fennel, Citrus and Chiles” and was quick to schedule into our weekly menu. The citrus component included both blood oranges and Meyer lemons, and if you’ve never tried Meyer lemons, you are missing out. A cross between a lemon and a mandarin orange, the Meyer lemon has smooth golden skin the color of a fresh egg yolk. It also has a thin edible rind, a high volume of juice and none of the tartness of a regular lemon. To stay on point, blood oranges are also popular in vinaigrette-style dressings, and are sometimes used to flavor niche-market beer. And then a light bulb went off in my head! Wouldn’t the juice of blood oranges pair fabulously well with vodka? With that, I started Googling cocktails containing blood orange juice. Not to be disappointed, there was a wealth of info on that category. To mention a few: Blood Orange Martinis, Blood Orange Cosmo, The Chameleon, Blood Orange and Ginger Punch, Blood-bath Punch, Big Game Red Rooster Cocktail… well, you get the idea. So the next time I was at the grocery store, I purchased an entire bag of the fruit, and immediately juiced and strained half of them. I bet you’re wondering what drink I did make, heh? Truth be told, the juice is in the freezer so that when I make up my mind, I’ll be at the ready. FYI — Blood orange juice is delicious, but because it is sweeter than classic orange juice, it ferments quickly and should be used or drunk the same day it is juiced. The finished plate of seared scallops with blood orange-shallot sauce. 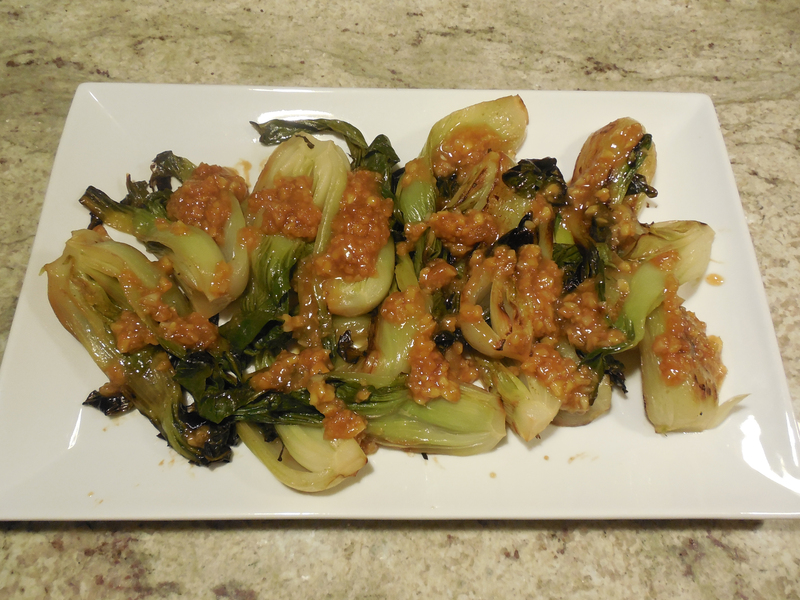 Side dish of braised baby bok choy in a ginger scallion sauce. 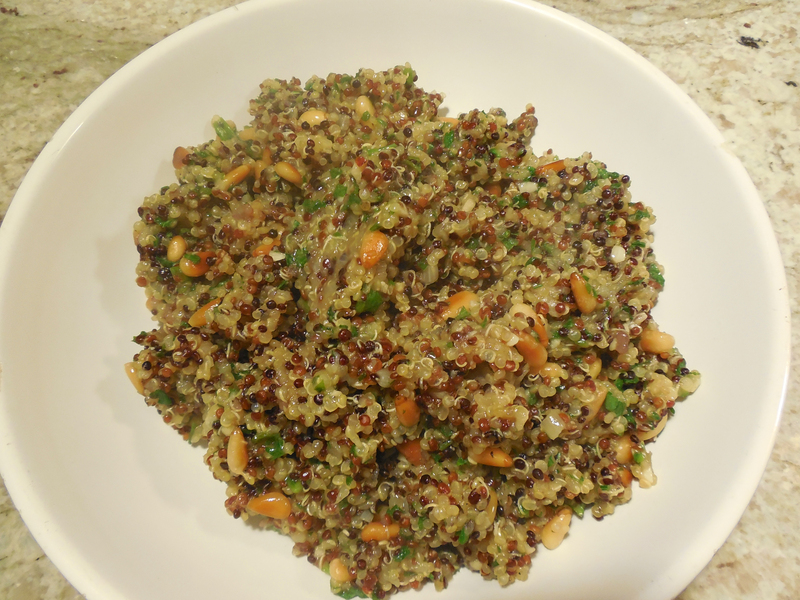 Another side, this one of quinoa with parsley and toasted pine nuts. 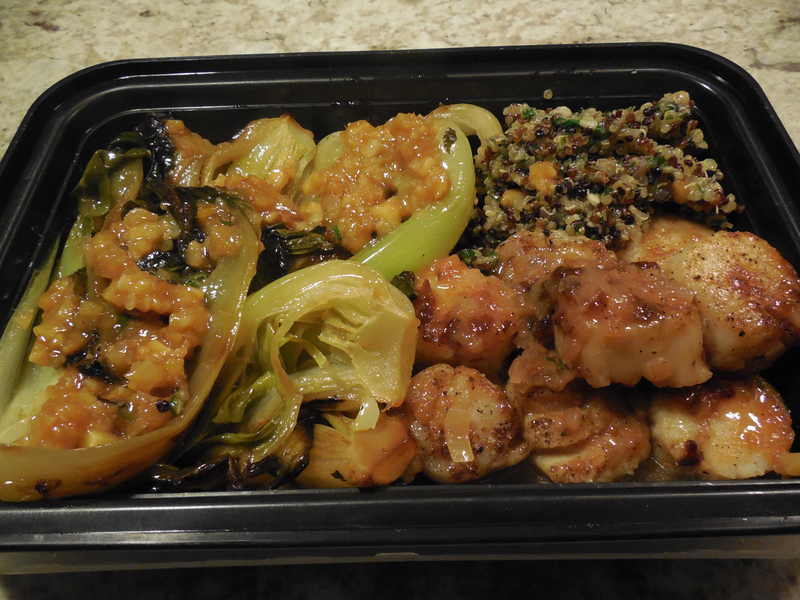 The leftovers made for a great lunch to bring to work the next day. Pat the scallops dry and season on both sides with 3/4 tsp. salt and 1/2 tsp. pepper. Heat 1 Tbs. pf the butter and the oil in a 12-inch nonstick skillet over med-high heat until the foam from the butter subsides. Add the scallops and cook, undisturbed until well-browned, 2 to 3 minutes. Flip and cook the second side until browned and barely form to the touch, 1 to 2 minutes. Transfer to a plate and cover. Add the remaining 1 Tbs. butter to the skillet. Add the shallot and 1/4 tsp. salt; cook, stirring, until softened, about 2 minutes. Whisk in the juice and season to taste with salt and pepper. 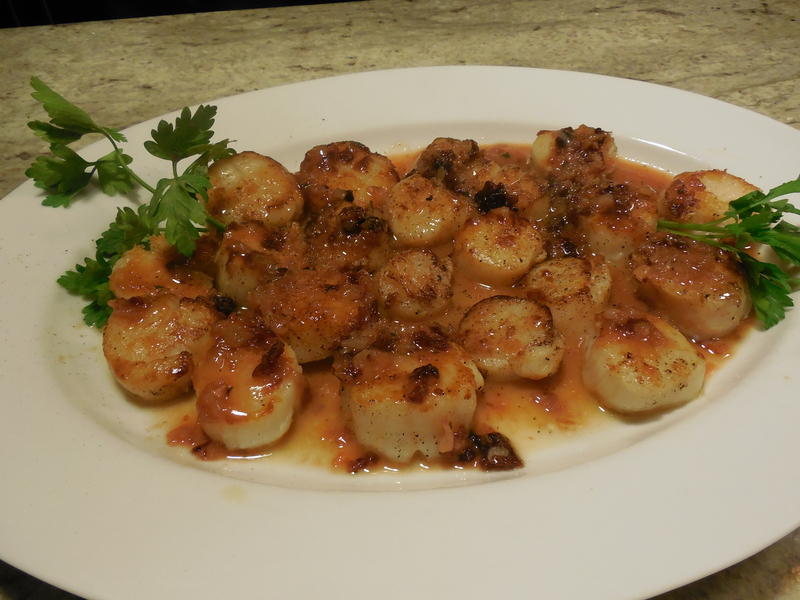 Serve the scallops drizzled with the sauce and sprinkled with a little black pepper. 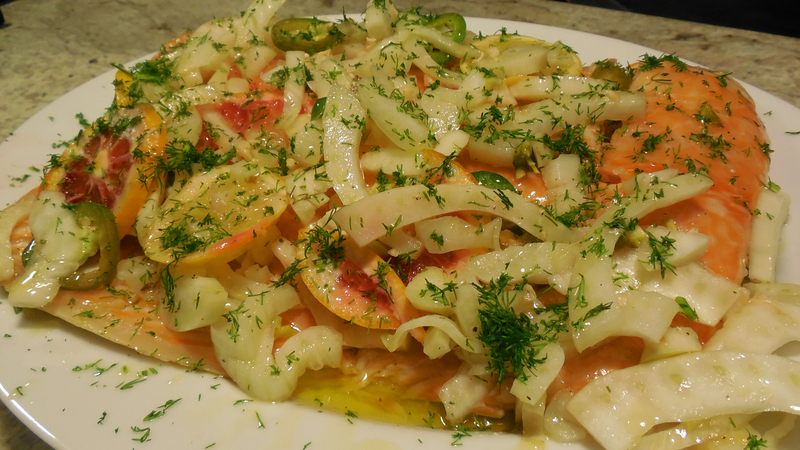 The dish before cooking without the salmon displays all of the vivid colors of the citrus and other veggies. A close-up of the finished slow-roasted salmon entree. Preheat oven to 275 degrees (although next time we would increase the temperature to 300 or 325.) 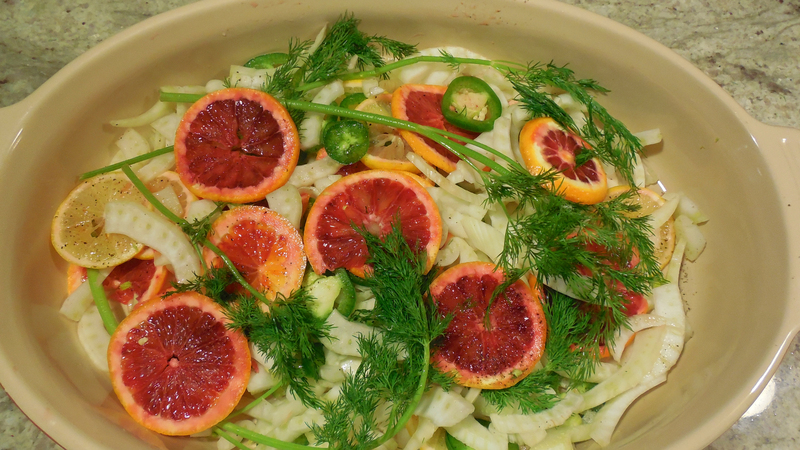 Toss fennel, orange and lemon slices, chile and 4 dill sprigs in a shallow 3-qt. baking dish; season with kosher salt and pepper. Season salmon with kosher salt and place on top of fennel mixture. Pour oil over. Roast until salmon is just cooked through (the top of a knife will slide through easily and flesh will be slightly opaque.) about 40 minutes for med-rare. Transfer salmon to a platter, breaking it into large pieces as you go, using a spoon to make imperfectly sized pieces. Spoon fennel mixture and oil from baking dish over; discard dill sprigs. Season with sea salt and top with fresh dill. Oh yeah, and we even have a very tasty blood orange olive oil and a vinegar we picked up at The Tubby Olive in Newtown, PA — great for salads! Recipe looks wonderful. Try a blood orange cheesecake for indulgence! Also, Blood Orange Brownies are the best! Substitute blood orange olive oil for the oil in any brownie mix. You can find the olive oil at The Tubby Olive (Newtown, PA), and also located in Doylestown and Reading Terminal Market in Philly. A nice twist on dessert!